WASHINGTON, Nov. 9, 2018 /PRNewswire/ -- Students who live in affordable, subsidized housing across the country are pursuing higher education with the help of scholarships funded by Apartment Investment and Management Company (Aimco). 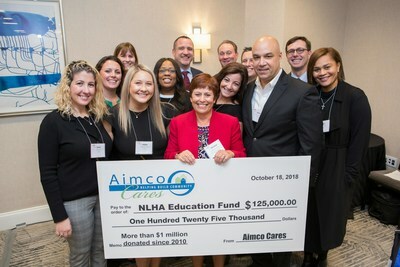 Aimco's 2018 donation of $125,000, raised in the 15th Annual Aimco Cares Golf Classic, brings the company's total contribution to the National Leased Housing Association (NLHA) Education Fund to $1.7 million in the last nine years. Aimco East Area Vice President Kevin Mosher and Regional Vice President of Operations Jason Kessler were joined by Aimco Washington, D.C. team members and top tournament sponsors Apartments.com and ARA to present the contribution to NLHA Executive Director Denise Muha. "This donation is an incredible way to mark the beginning of our 10th year of partnering with the NLHA," said Kessler. "What makes us even happier is that our dollars have enabled 233 deserving students attain their dream of higher education." "We are so grateful for the strong support we have received from Aimco Cares and the companies that support its annual golf tournament," said Muha. "We are honored to be a beneficiary of Aimco's generosity and we know that it makes a critical difference in whether a student in affordable housing can go to college." More than 120 golfers and 60 companies supported the tournament. The Diamond Sponsor, contributing more than $30,000, was RentPath. Platinum Sponsors, contributing $20,000 or more, were Apartments.com, the law firm of Harris Winick Harris, Karndean Design Flooring and RealPage. The Gold Sponsors, contributing at least $10,000, were Advantage Fitness Products, ARA, Cognizant, Colliers International, Comcast, Deacon, Emser Tile, Fidelity National Title Group, Interior Logic Group, International Property Advisors, JLL, Kutak Rock LLP, Lockton, Moen, Mohawk, Moran & Company, ProGroup Contracting, Sherwin Williams, Tidwell Group, Transwestern, Tryba Architects, Wilmar and Zillow Group.